Retaining multiple, easily accessed physical copies of business data, on disks that the business possesses and knows the location of, helps recover quickly from data theft or loss. CRU recommends the 3-2-1 backup rule to protect data. 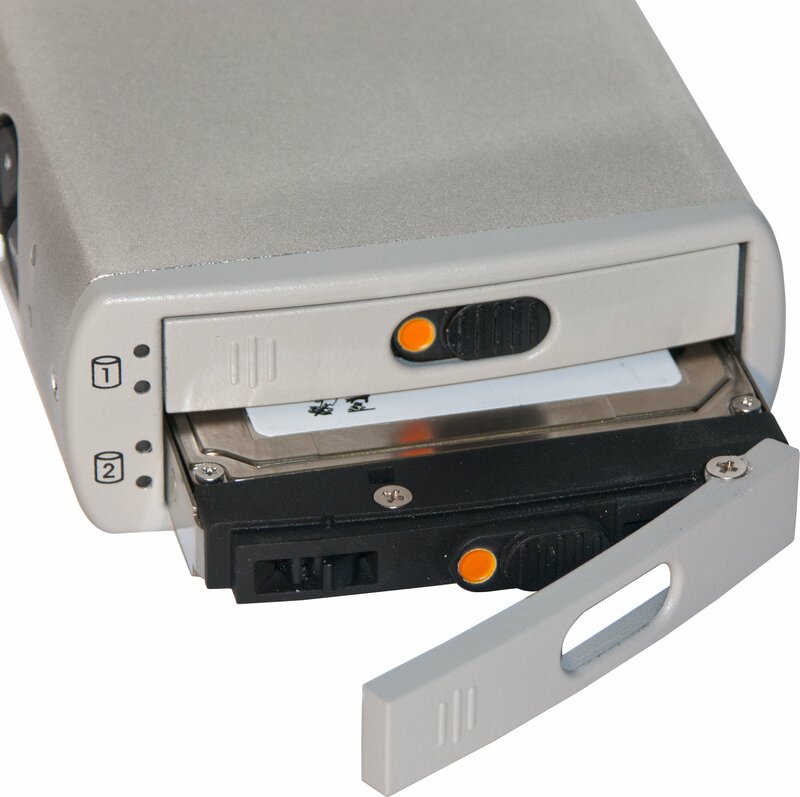 Hard disk backup is a key component of this system, utilizing disk enclosures to allow for expandable disk space and multiple backup copies. Make three copies of data. Using two different types of media. Keep one copy at a separate location. This diagram helps illustrate this concept. Copy the same data files to different disks. This way, should one disk fail, it won’t take the only copy of that file along with it. Maintaining at least three copies of data may seem like it increases cost–in the form of purchasing more hard disks or cloud storage–and require more effort to keep everything organized—but the payoff is priceless. “Media” means hard disks, CDs, tapes, thumb drives, DVDs, Blu-ray disks, etc. The idea with using different types of storage for extra copies is to protect against different types of technology failures, obsolescence, or environmental hazards. Note that it’s a good idea to test these forms of backup occasionally since technologies that seem like they’re permanent are really not (CDs and DVDs, for example, lose their ability to maintain data after a few years). Maintain one copy of the business’s data away from the location where the primary backups are stored. This might mean keeping a copy with an IT consultant, taking one to a business owner/manager’s home, keeping it in a bank safe deposit box, or with a trusted family member. The idea is to spread out the risk of losing all backups. In this case, using a cloud service as an offsite backup may be a good choice, too. Using a 2-bay hard disk enclosure in a RAID1 configuration is a good primary storage option. The RAID1 setup creates a real-time copy of the working disk. With RAID1 setup, creating two identical copies of the same set of data is effortless. To make a third copy, save the contents of the drive onto a BluRay disc, DVD, or another disk drive every few days or so, and take the third copy home. Another way to create a third copy is to rotate a third disk into the RAID1 setup, allowing the RAID system to rebuild and create another identical copy of the data. As part of this process, it’s important to rotate the offsite backups into the primary enclosures, swapping out one of the disks and taking that one offsite. Using an offsite backup disk as part of the primary backup system is good, because it will spin up the disk, and provide an opportunity to make sure the offsite disk is operational and updated with the latest backup. Using bare drives and multi-bay enclosures is a great way for businesses to manage their data backups. 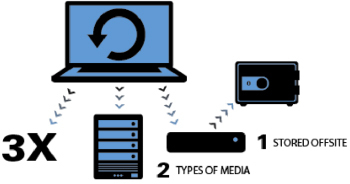 Here are three examples of the types of bare disk backup systems that businesses implement. Fluent Architects in Chicago has a bustling office that’s always on the go. Almost all the architects and project managers have laptops and those laptops go with them whether at job sites or home at the end of the day. There is a staff meeting on Mondays and that’s generally when all the laptops are in the building and the best possible chance for backup to occur. The IT consultant sets those systems to back up during the staff meeting. The CRU DataHarbor backup appliance runs the backup during the hour-long meeting and there is no downtime for the architects and project managers. Their IT consultant also runs a CRU RTX 2-bay device attached to the network server, to back up company files. He rotates a third drive in the RTX tower, and rotates between three drives with the DataHarbor backup. This way, there are always three copies of their data. Polara Studio is a busy commercial photography and videography studio. Their staff takes CRU ToughTech Duos with them when they go off location for photo and video shoots. This way they can create real-time copies of their work as they store their files. At the studio, their work is downloaded to a pair of 4-bay RTX towers, creating four copies of all digital files. When full, bare drives are stored in Polara’s media library for easy retrieval if necessary. The studio owner takes a copy of crucial business data and projects home with him on disk each night, in case something happens at the studio. These drives are rotated into the RTX towers regularly to make sure they are being updated and to ensure that they are operational. O’Leary Tax Service has 10 networked computers with highly sensitive data. With personal finance records of thousands of clients including tax information and bank records, O’Leary chose the CRU DataHarbor system for their backup and disaster recovery solution. They have a robust disaster recovery plan that includes a five-drive rotation with drives at the lead accountant’s house as well as the receptionist’s home in case they need the backup data and one of the parties isn’t available. Because the hard drives are encrypted, they don’t need to worry about them being offsite. Unless the key is with the drive, it is inaccessible. To ensure there wouldn’t be issues, another accountant in the office keeps the key in a safe deposit box. Create a backup routine – the easier, the better. This involves identifying where and how data is created, minimizing employee downtime, determining storage needs, and recommending devices to accomplish backups. Put someone in charge – and hold them accountable. Often it’s preferable for the IT consultant to manage the backup process for a company, or at least to train people who perform the backups to make sure they are done regularly and correctly. Take a backup copy offsite – somewhere that is safe from disasters and theft. Storing them with an IT consultant is a good choice, and allows the consultant an opportunity to verify the disks and the backups stored there, as well. Safe-deposit boxes or a safe at a trusted employee’s home or other common choices to store the offsite backup. Validate backups regularly – pull the copies from storage (even the offsite ones) once a month or so and use them to make sure the data is safe and the disks are still operable.